172 times safer than your family automobile. 8 times safer than passenger trains. 4 times safer than transit buses. 4 times safer than intercity buses. 8 times safer than scheduled airlines. A typical school bus carries 54 children. An any given school day in the United States, approximately 480,000 school buses are at work transporting over 25 million students. More than half of all students take the bus to school. School buses are an efficient way of transporting students. Each bus replaces about 36 cars that otherwise would be needed to transport kids to their schools. If there were no buses, 17,333,333 cars would be needed to drive students to school. On average, each school bus travels about 12,000 miles annually, for a national total of 5,760,000,000 miles. This saves approximately 62,399,998,800 miles of personal, individual car use each year. 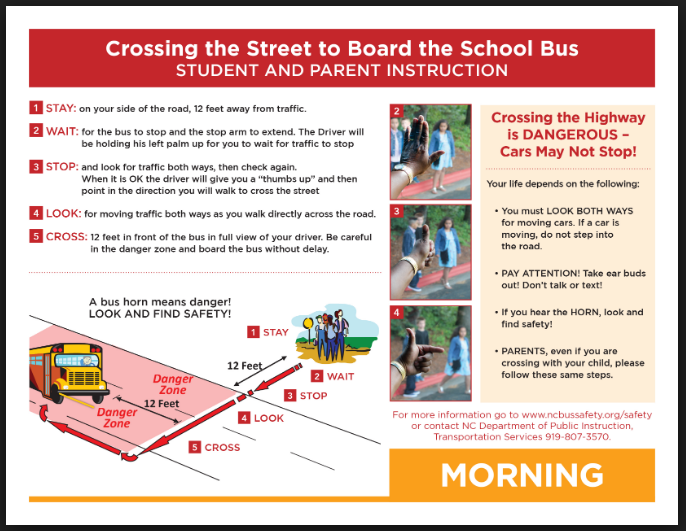 Know and understand that yellow flashing lights indicate the bus is preparing to stop to load or unload children. Motorists should slow down and prepare to stop their vehicles. 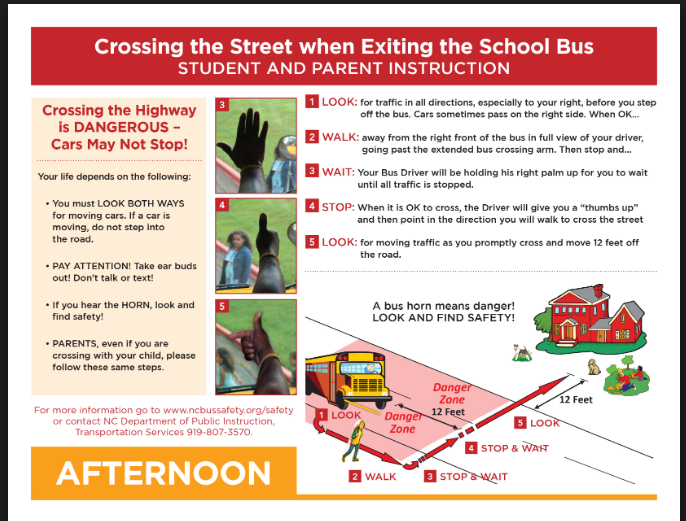 Know and understand that red flashing lights and extended stop arms indicate that the bus has stopped, and that children are getting on or off. Motorists MUST stop their cars. Our most frequently asked question......... When should my students be out for the bus? High School / Middle School students need to be out looking for the bus by 6:20 in some areas. Please be aware the bus very well may not come that early. But please be prepared just in case it does. Bus colors and routes with Driver names and Bus numbers are available. Please click the appropriate link. The 2nd most frequently asked question......... Where is the bus stop? Trailer Parks, Apartment Complexes and some subdivisions have group stops. If you are unsure where the stop is please refer to the listing below, or ask a neighbor. Most other students will be picked up in front or very near their homes. If you are unsure where the stop is in that situation wait at the end of your driveway and the driver will let you know where the stop will be. If there are several students within a very short distance the stops must be combined. Applecreek - The stop for both busses is at the designated sign. Burkeshire Point - The elementary stops are at the Mail Boxes - please be aware there are 3 different elementaries that come in . Make sure you are getting your student on the correct bus. High School / Middle School students walk. Eagle Point - The elementary stop is at the Playground in the morning and at the Mailboxes in the afternoon.! The High School / Middle School stop is out to Elms Rd. Gaines - High School / MIddle School students may get on at the Post office or the Fire Station. Genesee Village Apartments - the stop for High School / Middle School is up toward Lennon Rd. The elementary stop is at the office building. Linden Lane - the stop for both busses is toward the entrance off Lennon Rd. Linden Place - the stop for both busses is in the back of the park off Dye Rd. Maple Creek - the High School / Middle School stop is out to Maple Rd. The elementary stop is towards the entrance. Be aware there are 2 elementary busses that come in. Please be sure its the right one. Mari-Dan - the elementary stop is out to Miller Rd. High School / Middle School students walk. Parkridge - High School / Middle School students go out to Elms Rd. Elementary students get picked up on the appropriate corners. Riverside Manor - the elementary stop is out to Morrish Rd. High School / Middle School students walk. South Valley - The elementary stop is at the Mailboxes. The High School / Middle School stop is out to Elms Rd. Swartz Creek Estates - The elementary stop is at the Mailboxes. The High School / Middle School stop is out to Seymour Rd. Swartz Creek Meadows. The stops are generally at the corners. The bus will not travel down all the individual streets. Please be aware busses do not come down dead-end roads or cul-de-sacs. Your student will need to go out to the corner. The video captured from surveillance cameras will be viewed by District personnel on a random basis and/or when problems have been brought to the attention of the District. Students or staff whose recorded actions are deemed to violate District policies, administrative regulations, or provisions of law may be subject to disciplinary action. A video may be used by the District as evidence in any disciplinary action brought against any student or staff member arising out of the individual’s conduct on District property. When appropriate, video captured may be referred to or viewed by law enforcement agencies. The District will comply with all applicable state and federal laws related to the retention and release of public records.